This course is offered by SkillShare to meet the first aid training needs of child minders, child carers and anyone who may find themselves responsible for children. The course covers information regarding first aid specifically for babies and children. 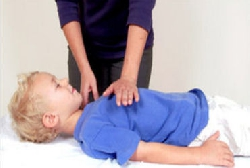 The course is designed to provide people with the skills and knowledge to deal with any situation, whereby a child has taken ill or been injured, as effectively as possible. The skills learnt on this course are also useful for people who have permanent responsibility for children e.g. parents and carers. The course meets the requirements of OFSTED, NCMYS and EYFS.